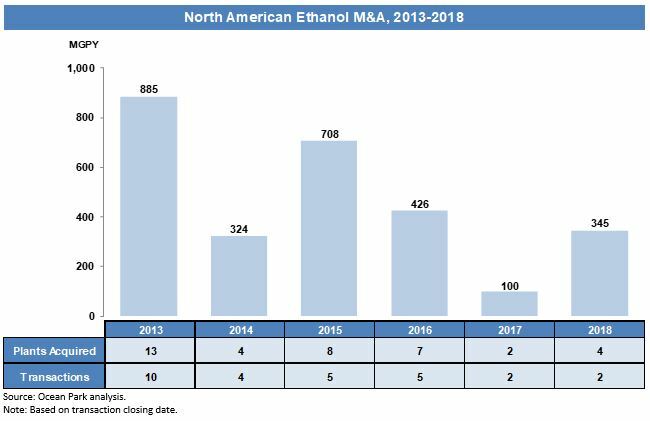 Merger and acquisition (M&A) activity in biofuels picked up considerably in 2018 after a slowdown in 2017, and by historic standards, the deals grew considerably in size. 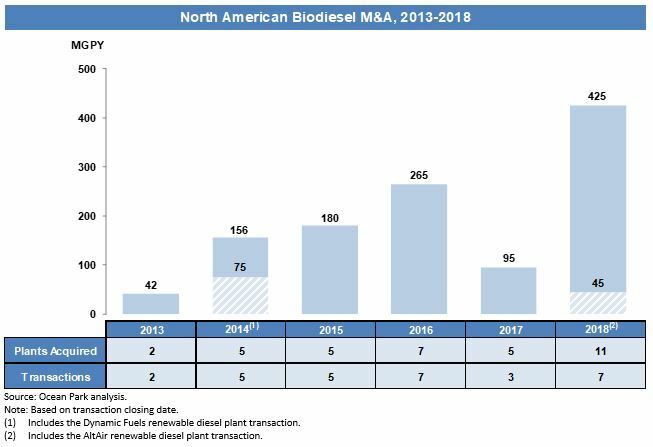 A total of 12 M&A transactions in the North American biofuels industry closed during 2018. In ethanol and biodiesel, nine deals took place worth an estimated $752 million, involving 15 facilities with 770 million gallons per year (MGPY) of capacity. In advanced biofuels, three transactions occurred involving two cellulosic ethanol facilities and one demonstration facility. Two of these deals included the largest publicly reported biofuels M&A transactions since 2015. In ethanol, the sale of three Green Plains’ operating plants to Valero for $319M became the largest transaction in the ethanol sector since 2015. Post-transaction, Valero becomes the second largest ethanol producer in the U.S., accounting for 11 percent of total U.S. ethanol production capacity. In biodiesel, the $345M combination between World Energy and BIOX Corporation took the mantle as the largest publicly announced biodiesel merger ever. The dollar-per-gallon transaction valuation of $1.17/gal reflects the high-margin operating environment for biodiesel in the U.S. The two companies had a history of working together, having previously formed a joint venture in 2016 to acquire a biodiesel plant in Texas. While a few large strategic players focused on acquisitions in 2018, other biofuels producers focused on plant constructions and expansions. Ocean Park tracked 1.0 billion gallons per year (BGPY) of announced expansions and greenfield projects in 2018. POET’s new 80 MGPY plant in Shelbyville, Indiana. The Andersons’ construction of a 70 MGPY facility with ICM in Colwich, Kansas. Valero and Darling will invest $1.1B to expand their Diamond Green Diesel renewable diesel facility by 400 MGPY before 2021. World Energy will invest $350M to expand its Paramount, California refinery that produces renewable diesel and alternative jet fuel, from 45 MGPY to 306 MGPY. REG submitted plans to expand its Geismar, Louisiana renewable diesel facility by 47 MGPY. REG completed an expansion of its Ralston, Iowa biodiesel facility from 12 MGPY to 30 MGPY. Andeavor announced plans to convert its Dickinson, North Dakota petroleum refinery to process 12,000 barrels per day of feedstocks into renewable diesel. The increase in M&A deal volume in 2018, particularly in the biodiesel and renewable diesel space, underscores the ongoing convergence of renewable fuels producers and traditional petroleum refiners. The growing costs of compliance are motivating players to add low-carbon capacity through M&A, expansions and new construction. Mercuria acquired Noble Group’s ethanol plant in South Bend, Indiana.. As part of a restructuring, Noble divested its only ethanol plant in the U.S. Noble had originally purchased the non-operating plant in 2013. A Swiss-based commodities firm, Mercuria has no other ethanol assets in the US. Valero acquired three ethanol plants from Green Plains in the Midwest. With this acquisition, Valero expanded its production capacity 20 percent to 1,700 MGPY, across 14 ethanol plants. The plants, located in Indiana, Iowa, and Michigan, have a combined production capacity of 280 MGPY. The transaction helped Green Plains strengthen its balance sheet. Innoltek acquired Evoleum in St-Jean-sur-Richelieu, Quebec. Innoltek plans to invest an undisclosed amount to restart the 5 MGPY facility. World Energy acquired a renewable diesel/renewable jet fuel facility and other assets from Delek in Paramount, California. The biofuels producer acquired Delek’s interests in AltAir Paramount for $72M. The purchase included a 63-acre complex consisting of a 45 MGPY renewable diesel/renewable jet fuel production facility, 1.7M barrels of product storage, truck racks, rail storage and 71 miles of pipelines. World Energy merged with BIOX Corp. World Energy partnered with an investment group led by CFFI Ventures on a capital raise and merger with BIOX Corporation in a $345M deal. The combined company has total biodiesel capacity of 296 MGPY, making it the second largest biodiesel supplier in the US. HERO BX acquired a biodiesel plant from Midwest Biodiesel Products in South Roxana, Illinois. The non-operating 12 MGPY plant sold through an auction. HERO BX anticipates operating the plant at 15 MGPY with multi-feedstock capability. HERO BX acquired a biodiesel plant from Tenaska in Clinton, Iowa. HERO BX acquired another non-operating biodiesel plant, adding 10 MGPY to its total production capacity. Green Energy Biofuel purchased an idle plant in Warrenville, South Carolina. The biofuels producer plans to invest $4.3M in the 40 MGPY facility over the next few years. Crimson acquired SeQuential in Salem, Oregon. The California-based biodiesel producer acquired SeQuential, a 17 MGPY operating biodiesel plant. The combined operations will form one of the largest biodiesel companies on the West Coast. Frankens Energy acquired the former INEOS Bio plant in Indian River, Florida. The deal included the non-operating cellulosic ethanol facility and 150 acres of land. Frankens Energy plans to convert a portion of the site into an industrial eco-district for sustainable industrial businesses. In December, Frankens announced plans to sell the surplus land and equipment through an auction. VERBIO acquired DuPont’s cellulosic ethanol plant in Nevada, Iowa. A leading German bioenergy producer acquired the 30 MGPY plant, with plans to convert the plant to produce renewable natural gas. VERBIO expects to use corn stalks, husks and cobs as feedstock. Tiger Capital Group acquired the physical assets of Inaeris Technologies. The assets included a demonstration facility, pilot plant and lab equipment located in Pasadena, Texas. Inaeris had previously used the site to convert cellulosic biomass into drop-in fuels. Regulatory: The year 2019 starts out with the looming question regarding the extension of the biodiesel Blenders Tax Credit (BTC), also not in place for 2018. Similarly to the BTC for 2017, retroactively reinstated in early 2018, the industry actively seeks reinstatement, retroactively, in early 2019. Elsewhere in renewable fuels policy in the U.S., the EPA finalized renewable volume obligations for 2019 and 2020. A big win came for biomass-based diesel volumes for 2020, which increased 15 percent to 2.43 billion gallons, up from 2.1 billion gallons in 2018 and 2019. Ethanol: U.S. ethanol producers continued to face strong headwinds in 2018 as profit margins deteriorated significantly through the second half of the year. The industry’s most active acquirer over the last five years, Green Plains, opted to divest several ethanol assets. High ethanol production levels, coupled with pricing pressure in corn and oil markets, will likely lead to more asset divestitures. Biodiesel: For 2018, the effects of the U.S. International Trade Commission’s ruling against biodiesel imports from Argentina and Indonesia resulted in increased domestic demand and record profits. In August 2018, operating margins were as high as $0.66/gal, the highest since November 20131. As a result of this favorable operating environment, many companies now have healthy balance sheets. Ocean Park expects an active M&A environment to continue as companies look for expansion opportunities. California’s Low Carbon Fuel Standard has been a key driver of increased production and local consumption of biodiesel and renewable diesel. The long-term, stringent carbon intensity reduction targets are motivating the expansion of new renewable diesel plants and continued M&A. Cross-border M&A might also be a theme as the financial incentives offered by the program attract global players. Advanced Biofuel:The permanent shuttering and subsequent sale of DuPont’s $400 million cellulosic ethanol facility highlighted the challenges for new advanced biofuels technologies. Difficult macro conditions are likely to continue throughout 2019 for advanced biofuels as a result of low oil prices and volatile public policy. Due to these increased investment risks, many financial and strategic investors may have little appetite for project financing of nascent advanced biofuels technologies. Existing advanced biofuels companies on a tight cash runway that are unable to stretch funding are likely to come under financial pressure and seek M&A as a strategic alternative. 1 Based on data provided by Iowa State University’s Center for Agricultural and Rural Development (CARD), which tracks biodiesel returns over operating costs for a typical continuous flow plant. Ocean Park is a boutique investment bank that advises on mergers and acquisitions, financings and restructurings with extensive experience in the renewable fuels, cleantech, food and agribusiness industries. Ocean Park has completed 28 renewable fuels M&A transactions since 2006. Any securities are offered through Ocean Park Securities, LLC, a member of FINRA and SIPC. Ocean Park’s professionals are licensed registered representatives of Ocean Park Securities, LLC. For more information, please visit www.oceanpk.com.